Women Fitness has just selected the Top 10 Most Beautiful Women Swimmers in the World. These women are actually like fish in water, but because of their beauty and perfect ten bodies they put the water they swim in on fire. 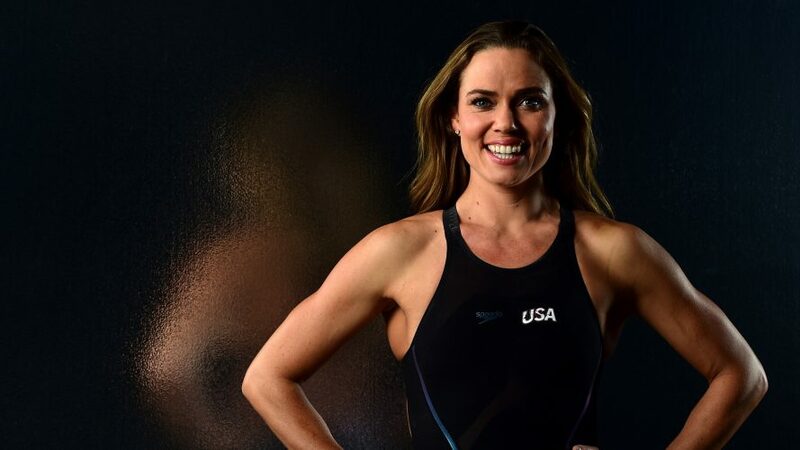 Natalie Anne Coughlin Hall was born on August 23, 1982. She is an American international swimmer and twelve-time Olympic medalist. Ten days before her 20th birthday in 2002, she became the first woman ever to swim the 100-meter backstroke (long course) in under a minute. At the 2008 Summer Olympics, she became the first U.S. female athlete in modern Olympic history to win six medals in one Olympiad, and the first woman ever to win a 100-meter backstroke gold in two consecutive Olympics. Coughlin’s success has earned her the World Swimmer of the Year Award one time and American Swimmer of the Year Award three times. She has won a total of forty-eight medals in major international competition, twenty-one gold, seventeen silver, and ten bronze spanning the Olympics, the World, and the Pan Pacific Championships. At the 2012 Summer Olympics, she earned a bronze medal in the 4×100-meter freestyle relay. Her total of twelve Olympic medals tie her with Jenny Thompson and Dara Torres for the most all-time by an American woman Coughlin was born in Vallejo, California, and is of Irish and one quarter Filipino ancestry. Coughlin first began swimming at the local YMCA when she was only 10 months old. She attended St. Catherine of Siena School in Vallejo, for kindergarten through eighth grade, and then Carondelet High School in Concord, California. While in high school in 1998, she became the first swimmer to qualify for the Summer National in all fourteen events. Coughlin broke two individual national high school records in the 200-yard individual medley (1:58.45) and the 100-yard backstroke (52.86). She graduated from Carondelet High School in 2000. Coughlin attended the University of California, Berkeley, where she swam for coach Teri McKeever’s California Golden Bears swimming and diving team in National Collegiate Athletic Association (NCAA) competition from 2001 to 2003. During her three years as a Cal Bears swimmer, she won eleven individual NCAA national championships, and a twelfth NCAA relay title. She was recognized as the NCAA Swimmer of the Year for three consecutive years; Sports Illustrated magazine named her its college Female Athlete of the Year. She graduated from the University of California with a bachelor’s degree in psychology in 2005 At the ninth World Aquatics Championships in Fukuoka, Japan, Coughlin won three medals—one gold, one silver, and one bronze. She won her gold medal in the 100-meter backstroke with Diana Mocanu(Romania) taking the silver and Antje Buschschulte (Germany) taking the bronze. Coughlin won her silver medal in the women’s 4×100-meter medley relay, teaming up with Megan Quann, Mary Descenza, and Erin Phenix; the Australians won the gold (Calub, Jones, Thomas, Ryan). Coughlin won her bronze medal in the 50-meter backstroke; fellow American Haley Cope won gold and Antje Buschschulte won the silver. At the ninth Pan Pacific Championships in Yokohama, Japan, Coughlin won six medals—four golds and two silvers. Coughlin won one of her gold medals in the women’s 100-meter backstroke with a time of 59.72, and another in the women’s 100-meter butterfly with a time of 57.88. Coughlin won her third gold medal in the women’s 100-meter freestyle with a time of 53.99. She won her fourth gold medal in the women’s 4×200-meter freestyle relay with Elizabeth Hill, Diana Munz, and Lindsay Benko. She won her silver medals as a member of the second-place U.S. relay teams in the 4×100-meter freestyle and 4×100-meter medley events. At the tenth World Aquatics Championships in Barcelona, Spain, Coughlin won two medals, including a gold and a silver. Coughlin won her gold medal in the women’s 4×100-meter freestyle relay and a silver medal in the 4×100-medley relay. medal in the women’s 100-meter backstroke, her only individual medal at these championships, with a 59.15. Coughlin led for the entire race, when in the last couple meters, Zhao Jing and Anastasia Zueva edged her out. At the 2012 United States Olympic Trials in Omaha, Nebraska, the U.S. qualifying event for the Olympics, the 29-year-old veteran Coughlin found herself in competition with a younger generation of American swimmers. In order to qualify for the U.S team in a given individual event, swimmers are required to finish among the top two. In the finals of the 100-meter backstroke, she finished third behind teenagers Missy Franklin and Rachel Bootsma, and finished seventh in the 100-meter butterfly. Coughlin also competed in the 100-meter freestyle, and finished sixth, qualifying to compete as a member of the U.S. women’s team in the preliminaries of the 4×100-meter freestyle relay. At the 2012 Summer Olympics in London, she swam in the qualifying round of the 4×100-meter freestyle relay, and did not swim in the 4×100-meter final, but earned a bronze medal when the U.S. team placed third in the final. It was her twelfth Olympic medal, tying the record previously set by American swimmers Jenny Thompson and Dara Torres for the most career Olympic medals won by a female U.S. athlete. One of Coughlin’s favorite hobbies is cooking. During the 2008 Summer Olympics, she was invited to prepare a Chinese-themed dish on the Today show. She has appeared as a judge on Iron Chef America. Coughlin competed in season 9 of Dancing with the Stars with season 1 professional champion, Alec Mazo. She was eliminated on the fifth episodeCoughlin appeared in the 2012 Sports Illustrated Swimsuit Issue.